A month during the semester where as a Panhellenic community we focus on academic success and accomplishment, and rewarding academic achievements. This month we will be highlighting some of our Panhellenic women’s experiences for Month of the Scholar. My name is Christina Thomas, I’m an accounting major and a senior here at USF. I’m currently the Vice President of Finance for Panhellenic and the Vice President of Finance for Kappa Delta this year. In the past, I have worked as the assistant to my chapter’s Vice President of Finance. I had an accounting internship this past summer in Seattle, Washington at Howard S. Wright Construction Company. With this internship I worked alongside the Lead Project Accountant with a Microsoft Project, helping them process a lot of Accounts Payable invoices (such as the bills we needed to pay) and month-end processes which included making sure everything was paid and sent out by the company. My internship helped me get hands-on experience with what I was learning in my courses since we don’t get exposure to that very much in class. The place that I had an internship with, Howard S. Wright Construction Company, said I could come back and intern there again after graduation and possibly get a job with them back home. With the Vice President of Finance positions, I have held, they have helped me get a lot of interviews for jobs after graduation. I am talking to a healthcare company to do accounting for them or possibly an engineering company working in their accounting department. The accounting opportunities are located here in Florida, so my decision will depend on if I can afford living here in Florida on my own for me to accept a job with them. Overall, my time here at USF has helped me learn how to be a leader and how to use my voice to express how I want the community to progress and having a voice within my own chapter. I think the leadership positions have helped me network more so that I can succeed after I graduate from USF this December. Sigma Kappa provides opportunities for members to become involved in community service and philanthropic initiatives. Through their overall philanthropy The Sigma Kappa Foundation they dedicate their time raising awareness for five national philanthropies (Sigma Kappa Foundations, Inherit the Earth, Gerontology, Maine Seacoast Mission, Alzheimer’s Research), however their local philanthropy focuses on Alzheimer’s Research. In 1984, Sigma Kappa realized they had a vision of a world without Alzheimers. Driven by the commitment “to live with heart for the brain” the Lambda Zeta chapter was able to raise over $14,600 this past year with their philanthropy event The Ultraviolet Music Awards (UVMAs) where sororities and fraternities compete against each other by making music videos and having a live performance. Each year the sisters of Sigma Kappa partake in the Walk to End Alzheimer’s in Tampa Bay as well as fundraising and raising awareness for the Alzheimer’s Association. Nationally, the sisters of Sigma Kappa have a goal of reaching $500,000 annually for their national platform. The Walk to End Alzheimer’s is the the nations largest to raise funds and awareness for not only research but for care and support for patients suffering from Alzheimer’s as well. 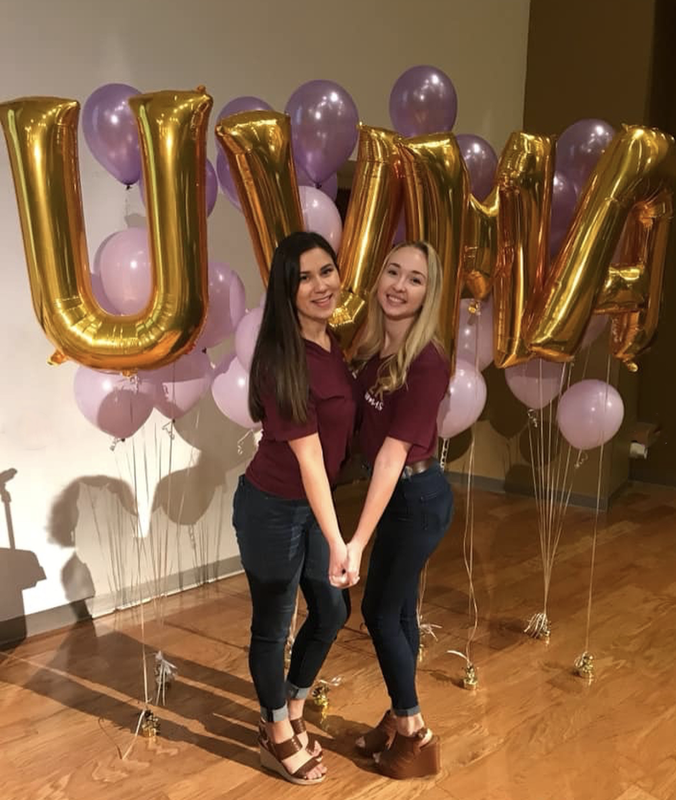 Through this participation, Sigma Kappa took their open motto “One heart, one way” towards Gerontology work, adding the emphasis of Alzheimer’s disease. Since 1989, The Sigma Kappa Foundation has granted more than $3 million dollars for Alzheimer’s with another donation of $1 million to go towards Women’s Alzheimer’s Research Initiative. Think Pink. Since 1992, Zeta Tau Alpha has proudly partnered with Breast Cancer Education and Awareness Foundation in hopes of one day diminishing this disease. Each year when the month of October comes along, instead of focusing on Halloween decorations the sisters of Zeta Tau Alpha instead decorate with Pink. Since 2004, during the month of “Pink-Tober” there have been over 19 million pink ribbons distributed in hopes of having as many people possible to “Think Pink.” Their outreach partner, the National Football League hosts pink out games with all 32 teams, and aids in distributing pink ribbons during specially set football games every year since 1999. In the spring, the women of Zeta Tau Alpha host their annual “Zeta Step Show for a Cure” philanthropy event where fraternities and sororities compete in a step competition. During this event the competitors will also decorate a bra to auction off to the audience. This past spring of 2018 during their 8th Annual step show, they were able to raise over $32,000. Zeta Tau Alpha also provides support and assistance with survivor recognition during Making Strides walks held around the country. With a philanthropy that has affected almost everyone, the sisters of Zeta Tau Alpha keep the mind set to Think Pink year round. Since 1936 Delta Gamma has partnered with Service for Sight, an organization that raises awareness for eye safety while also raising money for those with vision impairments, eye traumas, or vision loss. Each year the sisters of Delta Gamma host Anchor Splash, a synchronized swimming and dance competition, which over the past two years has been able to raise over $55,000. Delta Gamma is also partnered with Service for Sight: Joining Forces which allows collegiate women and alumnae to give back to service men and women who have suffered from vision trauma. Their Joining Forces campaign is in collaboration with the Wounded Warrior Project to help support our service men and women. Their commitment to “Do Good” is their driving force to make the world a better place is seen through the 120,000 hours dedicated to Anchor Splash as well as through the funds they have raised which has aided in opening up five schools across the United States for the visually impaired. Posts from the Rho Gammas: "Go Rho Gamma"
If you don’t know where to go, go Rho Gamma. Tell me about your Recruitment process and what that was like for you. I transferred in my Junior year with no plan or goals. I saw signs about leadership and women with confidence advertising about Greek-lettered organizations and thought “why not?” and signed up two days before registration closed. Unforgettable! I bonded immediately with the women I met on Orientation Night, I really enjoyed my Pi Chi group. My Pi Chis, Erin and Brooke, were literally amazing. It was an experience I didn’t expect, in the best way. I didn’t hear that much trash talk and Erin and Brooke did a good job about making sure we weren’t talking about other chapters. A few of the women in my Pi Chi group came over to my apartment one night to have a movie night, little did I know that two of them would run home with me on Bid Day. Bonding so well with my Pi Chi group was a mind opening experience and stepping stone because I felt comfortable with my Pi Chi group and it translated over to being comfortable within a chapter. I’m glad I did formal recruitment because I loved to talk and its easy when it’s about yourself. I believe that the formal process worked best for me because it gave me more opportunities to connect with a larger amount of women, as well as it gave me time to reflect on my feelings. This process helped me figure out what chapters had women that “fit with me” and women that would inspire me to become and do more. What helped you decide where you wanted to go? I had two chapters that were always at the top of my preference lists. I loved one chapter because of its diversity and sincerity, each woman I met showed me authenticity through the love they had for each sister. I loved another chapter because they looked and acted very well put together, yet, they started talking to me about things I wasn’t sure were a main priority in my life, so I didn’t feel like I wanted to see them again and I didn’t rank them very well by Sisterhood Day. So, with the two other chapters I saw on Preference Day, it didn’t matter to me where I went because I found a home within both. My organization was able to hook, line, and sink me on Spirit Day and everyone I was paired with through the week only reassured my decision and wish to become apart of their sisterhood. What made you stay after joining? My first semester, I was the social butterfly, I got close to everyone and was constantly around the house. Initiation doesn’t happen for us until the following semester of when you receive your bid. Right after being initiated I started to have some family-line issues, but who doesn’t? Despite the struggles, I enjoyed my summer and hoped for change when school started in the fall. When school started back up nothing had changed and I didn’t really come around that much anymore. I think the only reason why I stayed was because I had the hope of becoming a Rho Gamma. I had an advisor sign my Rho Gamma papers instead of withdrawal papers and that is the only reason I still wear my letters today. I pay my sorority experiences myself and had invested a lot of money and time into this, so I didn’t want to leave before my investment paid out. Rho Gamma did a lot to make me WANT to stay in my chapter now and it reestablished values of why I chose my organization and taught me new skills to improve my sisterhood. I also found a big appreciation for PHA and I sometimes feel like I hold my Rho Gammas letters above my own. What have you gotten out of sorority life since joining? LITERALLY THE LOVE OF MY LIFE, Alliyah, my ride or die, who is EVERYTHING to me. I have found mentors and forever friends, I learned many professional skills and I grew as a leader. I love my sisters, I have hundreds of thousands of women across the country and world I get to call my sisters. I am a lot closer to them than my biological sister and it’s been a roller coaster of an experience to feel a genuine, “sisterly” bond. I learned how to bite my tongue because I had a problem of voicing my opinion too much. Rho Gamma has taught me more appropriate ways to go about things and that has helped with my professional and personal development. My daily habits, such as prioritizing certain things, has changed, too. It was a very eye opening experience being a Rho Gamma with all the different women from different sororities. It opened my mind to PHA at USF, realizing that each organization has unremarkable women and that USF’s Greek community is one of a kind. It opened my mind to the idea that change can happen through a small group of women and I am very thankful for that experience as a Rho Gamma. I’m also surprised, but in a good way, about the Rho Gamma experience. Everyone usually raves about Rho Gammas but when I first joined I was thought, “Oh, this is not what I was expecting.” I was very hesitant for the first few weeks through the training and the twin process made me a little anxious because I wasn’t really connecting with anyone at that deep of a level. I wasn’t looking for my best friend but someone who can work with me as a leader, yet there were women who I wanted to reach out to, but they found their friends and I felt slightly discouraged. After I got my twin, I had mixed feelings. But, sitting down with her and learning everything about her, I can see how we can work together as leaders. Panhellenic Executive Board gained respect and gratitude from me after the pairing and after the Rho Gamma summer retreat, it was great to finally begin my journey as a Rho Gamma and I enjoyed how we’ve continued to use communication, accountability, and organization from the expectations we’ve set out earlier in the year as a Recruitment Team through the Formal Recruitment Process. Talking about this makes me want to cry, but I love Traci. I am super grateful for Rho Gamma because it brought me to her. Traci has helped me in a lot of ways, that not many people know about. I’m so grateful Traci is in my life as my friend, my study buddy, my hype women and forever my twin. Going back into my chapter was pretty dang smooth, yet the obstacle of being everyone's friend is still presented to me.Traci has given me reassurance and inspiration to overcome anything within or outside of my chapter and I have realized it is because she always has my back. I freaking love her, she’s amazing. I’ve never been around women who were genuinely confident in their decisions or themselves. I am very sure of myself, and when I was in High School and community college, the constant insecurity and anxiety from everyone around me discouraged me to make friends at the time. Being in PHA, it’s empowered me because it brought me to a group of women who are powerful and confident in themselves, where everyone is going to showcase to you their skills and talents. It’s also great to have an entire support system to give you snaps and tell you what you need to hear. It’s encouraging in a lot of ways. Even hearing them say, “you’re doing such a great job,” can change your entire day and being a part of that culture has been life changing. I was scared that I was going to have a hard time with my PNMs and relating to them. But, I love my PNMs so much and I still get hugs, texts, and FaceTime calls. After Rho Gamma, I’ve become more involved with chapters other than my own, I go to their house to do homework and others come over to our house. It’s shocking to see that, but it’s very comfortable because it feels like we are one now and not separate organizations. One solid community. The letters we wear do not define us, but are tools to break barriers.